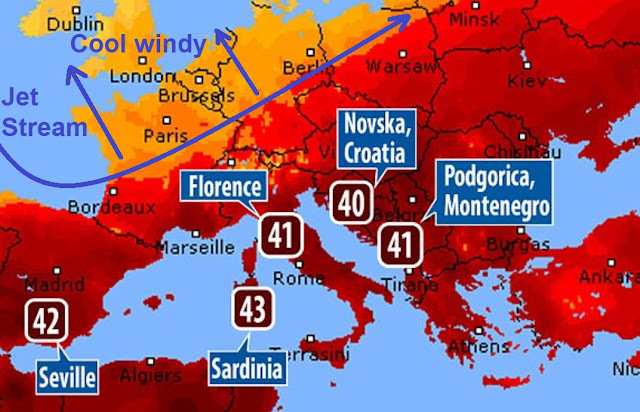 The Big Wobble: The latest killer heatwave in Europe is called 'Lucifer.' Extreme weather 'could kill up to 150,000 a year' just in Europe this century! The latest killer heatwave in Europe is called 'Lucifer.' Extreme weather 'could kill up to 150,000 a year' just in Europe this century! It's been a common theme throughout this summer in the Northern Hemisphere, killer heatwaves with temperatures humans should not have to endure and every summer recently appears to get worse, with this year especially oppressing from California to Japan. In Italy, the latest heatwave, nick-named 'Lucifer' by locals, has caused a 15 per cent spike in admissions to hospital emergency units and forecasters see no respite coming before early next week. It's brought wildfires to Spain, Italy, France, The Balkans and Romania, destroyed millions of Euro's of crops and killing thousands of cattle. Flash foods and lightning strikes are also increasing at an unprecedented level. But now The Lancet Planetary Health journal has written a new report claiming extreme weather could kill up to 152,000 people each year in Europe by 2100 if nothing is done to curb the effects of climate change, scientists say. The bleak pictured they paint could see such deaths rise from 3,000 each year between 1981 and 2010 to 152,000 a year between 2071 and 2100 and that's just Europe, the south western US has endured temperatures around 50 deg C or 122 deg F this year and Asian countries especially, India, Pakistan, Bangladesh and Sri Lanka have lost thousands of people to heat and floods. By 2100, weather-related disasters could affect two thirds of Europe's population per year, It comes amid a number of high profile heat waves which have hit the headlines recently, with tourists today warned to expect highs of 43°C in Croatia and Spain. Whatever your stance on climate change it is undeniable the weather is becoming more extreme year on year.